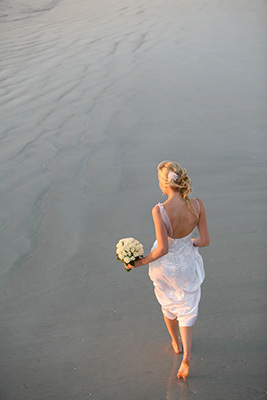 Of all the special days in your life, your wedding day is the day you want to look beautiful and feel special. When chosen wisely your wedding dress will truly enhance your appearance and give you that special feeling everyone dreams about. Most brides can’t wait to start trying on bridal dresses, but there are a few things you should think about before you hit the fitting rooms. So, join the team at True Bride as we discuss our Top 7 Tips for Choosing Your Wedding Dress! 1: When is Your Wedding? It is important to consider when your wedding is to ensure you have more options and choices. The earlier you start looking, the better. However, you need to balance this with the fact that trends and styles change. As a result, we suggest not to go looking for your wedding dress more than a year before your wedding day as your preferences may change. If you are having a couture bridal gown made, allow for eight to ten months before your wedding day as wedding gown designers may have a limited time frame for dressmaking. As a result, they can be booked up many months in advance. Further, if you buy your wedding dress online, give yourself plenty of time for the dress to arrive. It could take a couple months to ship and may need adjusting when it arrives. Finally, if you have a wedding dress designed for you it is wise to try on a few different styles to decide what style bridal dress suits you best. If your prefer a ready made wedding dress then starting around six months in advance should give you enough time to find your gown. 2: How Formal is Your Wedding? The style of your wedding dress should complement the style of your wedding, whether it is formal, informal, traditional or themed. The style of bridal gown you select should follow from your style decisions and the time of day of your celebration. 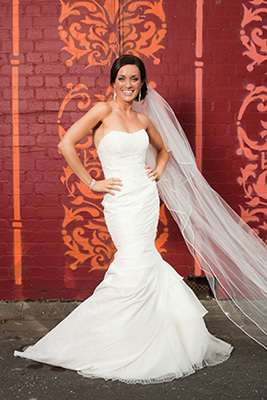 It is important also that the style of your wedding dress is flattering to your figure and enhances your best features. Traditionally, if you are having a formal wedding, a long gown is appropriate. As the old rule usually stated: ‘the longer the gown and the train, the more formal the wedding’. Full length wedding dresses are lovely for evening or formal weddings and are usually worn with a veil. For an informal wedding or a day wedding, you can still wear a long gown, but many brides favour more of a ‘slip dress’ than a full, formal bridal gown. Further, a shorter length dress works beautifully with a garland of flowers or a soft fabric hat as headwear. Long wedding trains are appropriate for large, formal weddings while shorter ones are more suitable for informal or day weddings. Wedding trains can made as detachable items to extend the useful life of the wedding dress. However, at the end of the day, these are just guidelines. You need to choose what makes you happy on your wedding day! 3: Who Should Shop With You? When looking for your wedding dress, it is best to take someone with you whose opinion you respect. It is also important to choose someone who won’t push you to make hasty decisions. When entering bridal boutiques, the rows and rows of ready made bridal gowns can be overwhelming. As a result, if you try to shop alone, you can feel quite alone and vulnerable to shop owners who are keen to make a sale and who don’t necessarily have your best interests at heart. For many brides, their mothers, sisters or best friends – or a combination of all three – are their chosen shopping buddies. But you should choose whoever makes you the most comfortable to shop with. Make sure whoever you shop with needs to be honest and kind so your expedition doesn’t end in tears. Wedding dress shopping should be fun, not torturous. The style of your wedding shoes should complement your dress rather than draw attention away from it. Covering your wedding shoes with a fabric matching that of your gown is a nice, subtle touch. However, if your dress is long enough, many brides enjoy making their shoes their “something blue” and wearing a cheeky blue shoe that can be seen peeking out while dancing. However, one of the most important things to remember is comfort! You are going to be wearing your wedding shoes all day, so you should choose a style and heel height you are comfortable wearing. You should also consider the time of year you are getting married. Open toed shoes might be too cold for winter, while closed shoes might be too uncomfortable in summer. Finally, don’t forget to “break in” your shoes before the big day. Wear them around the house if you can to make sure you are comfortable wearing them for your wedding day. 5: Traditional White or Not? The traditional white wedding dress is still very popular however modern trends have seen an influx in colourful wedding dresses. This includes subtle pastel blues and blush pinks – even golds – that peek out beneath lace to reds, black and white, and purple. Your wedding dress colour is purely up to your taste and choice. If you have always dreamed of the perfect white wedding gown, then go for it! If you want to try something out of the box with a bold coloured bridal gown, then you should! Wedding dress colours are incredibly personal and you should be the one to make the decision to make your day perfect. Click here to view our previous blog on the Top 5 Coloured Wedding Dresses. Accessories are important to truly finish your look. But it is easy to go a little too over the top with so many wonderful options at hand. Always remember to take into account your wedding bouquet, wedding dress style, and hairstyle when choosing accessories. The rule “less is more” is definitely one to keep in mind. There are a wide range of accessories available to complement your style for your wedding day, with everything from pearls, sequins, beading, crystals, lace, and flowers. Have fun and talk with your friends and family to pick the perfect match for your outfit. 7: Buy, Make or Hire? There are many options open to you when purchasing your wedding dress and your budget may determine the choice you make. Wedding dresses can change in style from year to year and you should consider the time of year, the climate and the comfort of your wedding dress. When buying an off the shelf wedding dress from a bridal boutique you are able to try several different styles and colours to ensure that you make the right choice. Alternatively, you may have the wedding dress designed and made by an exclusive fashion designer who can design a wedding dress in the style, fabric and colour which is most flattering for you. Another option is to hire your wedding dress. If you have a limited budget this is a very real alternative. Be sure to choose a reputable wedding supplier and ensure you have a complete fitting with all your wedding accessories before your wedding day.